Some of my absolute favorite things to eat are simple, blended vegetable soups. I make soups like this roasted carrot soup often, but I will alternate the ingredients and use a wide variety of vegetables as the star. Y'all, this was the first time I've ever made carrot soup! So, of course, I had to make sure the first batch wasn't just a fluke and I made a second pot of roasted carrot soup (that's the only sane way to handle a case of new recipe jitters, right?!) Well, I can honestly report that both batches turned out deliciously and I was thankful to know I had a successful recipe to share... and as a side benefit, my family's vitamin A and potassium intake levels will be epic over the next few days! 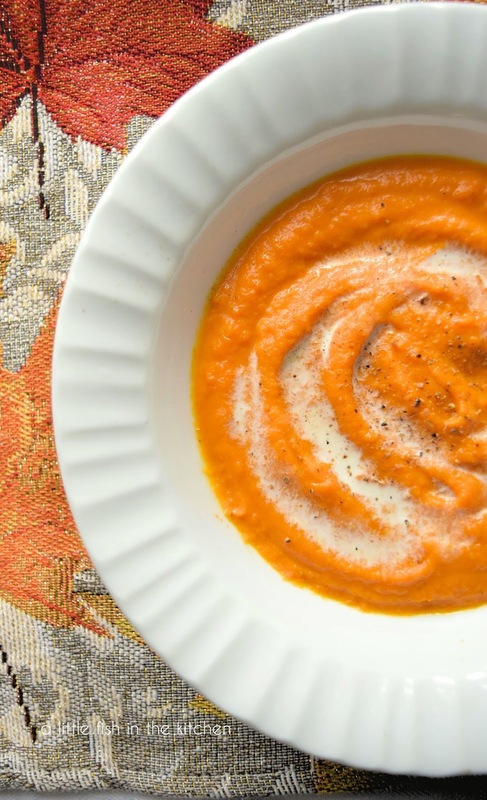 This roasted carrot soup has a lovely autumnal color and it's a pretty dish that would surely impress company. It's also easy enough for a healthy weeknight meal as it comes together very quickly using just a handful of ingredients. Seriously, if you have olive oil or butter, carrots, onion, broth, a couple of pantry-staple, dried herbs (or fresh herbs, if your thumb is greener than mine), salt, pepper and milk or cream in your house you, you're set and can make a go make batch right now. Really! What are you waiting for? Oh wait, and a blender or food processor is definitely needed too! Yep, can't forget the essential kitchen equipment for making a blended soup (although, I guess you could make a chunky roasted carrot chowder...hmmmm. Is that a thing? I'll look into this a bit further for a future post!). Soups and sandwiches will always be my first loves when it comes to home cooking and I've got a few of my favorite, hearty soups, stews and chowders listed in the recipe index on this blog. I'm definitely planning to add some more recipes to that collection over the next few months. However, if you like uncomplicated. creamy, veggie-based soups as much as I do, you might be interested in an old post about this creamy asparagus soup or my previously-posted recipe for this easy fire-roasted tomato soup that's made with canned tomatoes. Just F.Y.I, that fire-roasted tomato soup is a perfect match for an ooey. gooey grilled cheese sandwich! Now I can add this satisfying roasted carrot soup to that short list of smooth, creamy vegetable soups too. And I sincerely hope you all enjoy it as much as we do! 1. Pre-heat oven to 400°. 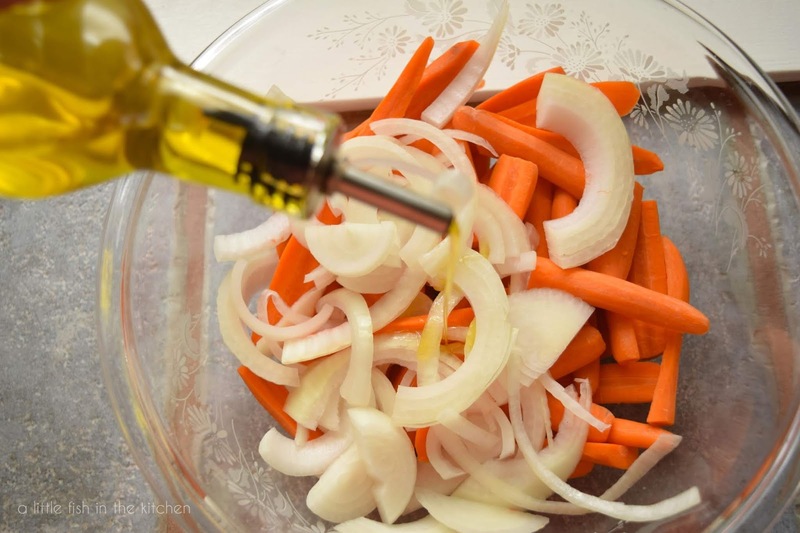 In a large bowl, toss sliced carrots and onion with olive oil and season lightly with salt and pepper. 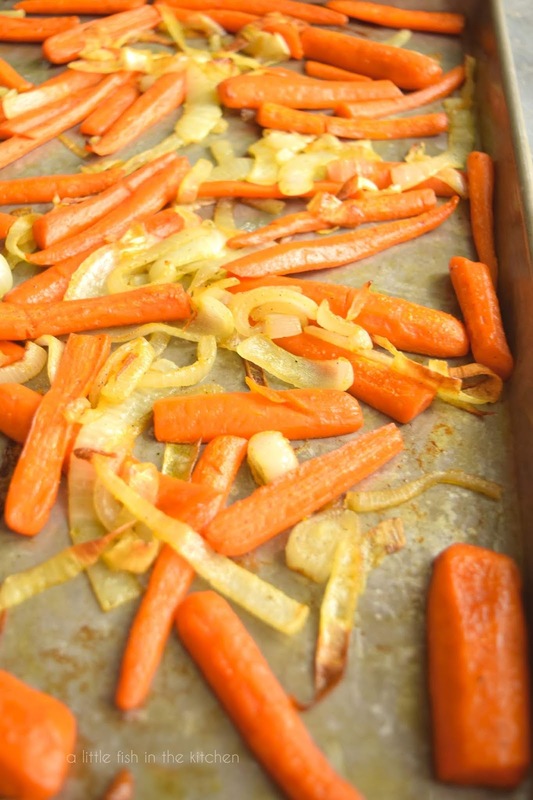 Spread the coated veggies evenly onto a baking sheet and place it in the oven. Bake for 15 minutes then stir veggies on the pan and lightly season again with salt and pepper. Bake for another 15 minutes or until carrots are tender and the edges on the onions are slightly browned. Remove pan from the heat and set it aside on a cooling rack. 2. In a medium-size sauce pan, add broth and the herbs. Bring pot to a boil and then reduce heat and simmer for about 10-15 minutes. Place the cooked vegetables and 3 cups of broth in the bowl of a large blender or food processor and pulse until smooth. If the soup is too thick for your preference at this point, add the remaining 1 cup of broth and pulse until smooth. Return to sauce pan or another larger pot, if necessary. Bring soup back to a boil and then remove from the heat. Stir in the half and half. 3. Garnish soup with an extra drizzle of cream, and freshly cracked black pepper. It's also delicious garnished with green onions and seasoned croutons... or all of the above! Serve roasted carrot soup hot as a starter or as a meal along with some crusty bread and a green salad. Enjoy! The soup must be particularly delicious and flavourful using roasted carrots and onions. Good morning, Angie! Thank you! So beautiful and so simple... love the roasting idea - I can only imagine how it concentrates the flavors and adds a special warmth! 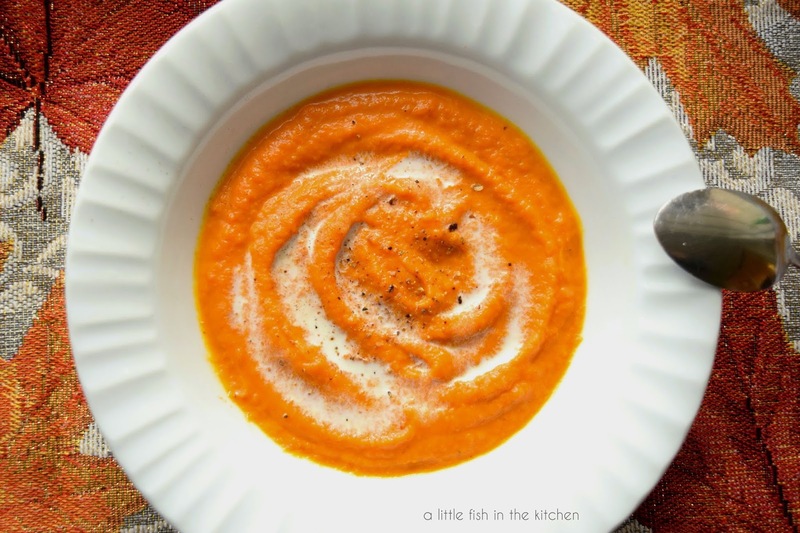 Roasted carrots have such a delicious flavor that they surely made your soup outstanding.